Happy Monday! Hope you all had a great weekend! Started the new week with this little chicks bento. I made flower shaped onigiri stuffed with salmon chunks then put small egg rice ball on the top and decorated it. This morning, I used my rice mold shown below to make the small egg rice ball. 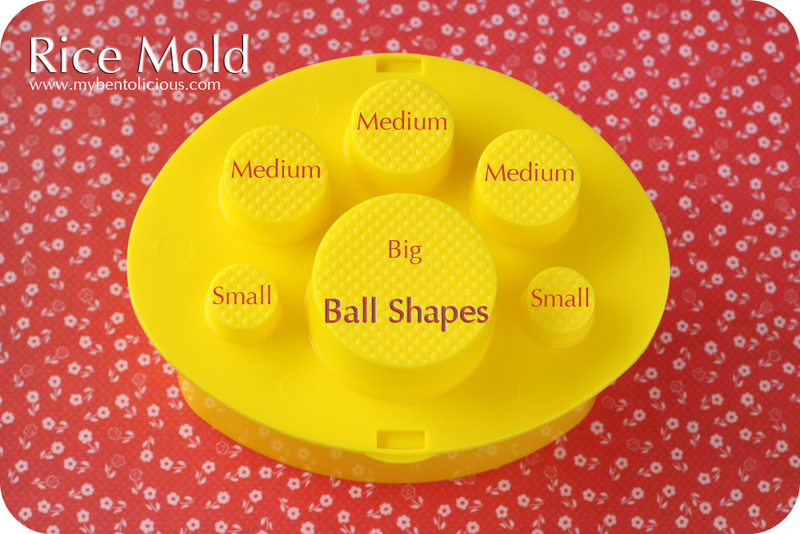 Rice mold is quick and easy to use. Save a lot of time for bento making in the morning :) But you can always mold your rice with your hands as the ball shapes it's also pretty much easy to make. In the other box : cherry tomato, steamed broccoli, half hard boiled egg, carrot & chicken ham, and tofu fish cakes. Don't forget to join July's BOMB. You can read more from Debra's blog : Hapa Bento. This month theme is picnic bento. cute，i like it vy much !! @仪仪妈咪 : You are the first today hehehe ... Thanks a lot 仪仪妈咪! Oh my, those chicks are so cute! You are really the best and the bento is so sorted. A thing I like most in bento. Oh my..... cute as always. 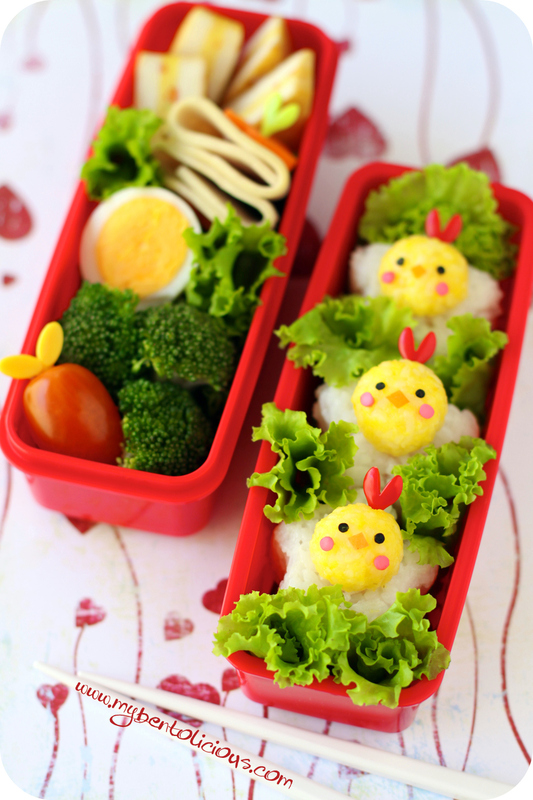 Great cheerful bento to start the week, love the sweet chicks tucked in pretty leaves! Lovely as ever and I liked the clever positioning of your watermark, cute! What cute little chicks for early Monday morning!! I really like the rice mold...I haven't seen one like this before. I'll have to keep a look out for one. These chicks are so cute! I've never seen a rice mold like that. I would come in handy! those chicks are so sweet and adorable, and i love the idea of a mini-onigiri topper for the main (flower-shaped) onigiri. i have more of your posts to catch up on lia and they all make me smile! This is wonderful Lia! Can you explain how you make egg rice? Cheep cheep! Cute chicks . Love the molds too! It's so handy. Again another new creation! Love those little chicks, look so happy! So bright, sweet and cheerful on this Monday morning! Thank you for brightening my day as you always do Lia! Love the little chicks! Your bento definitely brightened up my day after a whole night of mid night work in the office! Hi Lia, where did you get the rice mold? never seen like that one before ^_^ .. great bento as always! @Just a MOM : Thanks a lot Lin! Got that from a friend in Japan. But saw that before on ebay or perhaps you can check on www.bentocraft.com (Malaysia) or www.obentohouse.multiply.com (Indonesia). Thankx, lol newbie here. Where would I get said rice recipe for rice ball making? I make spanish rice alot, and the rice is sticky in general well our white one is more sticky. Where are there cool recipes, or maybe I have not gone that far yet, I am still searching lol.